Includes velour carrying bag and can be transported inside the instrument bell. 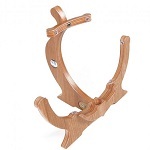 -Three-way tilt adjustment for precise placement. -Two metre electrical cable with on-off switch. -Screw-on clamp adjustable up to 20 mm. 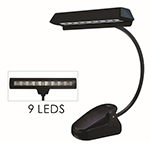 -Uses only tubular bulbs with a maximum rating of 25 watts. 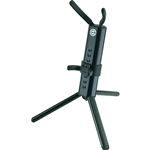 Function: Available for Music Stand, Book, Repairing etc. 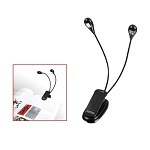 * Great for pianos, music or book stand, orchestra pits, dark clubs, etc. 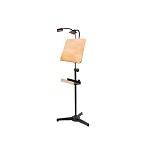 design so it can be attached to a music stand as easily as placed on a piano. in dark clubs, at mixers and orchestral use. 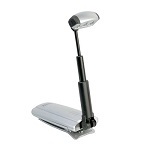 The light can be used cordless with 4 AA batteries, or with an optional GYC PS500MA AC adaptor. 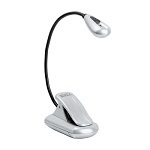 The light beam is fully adjustable with an arm that collapses for pocket-sized portability. as well as book readers and travellers. 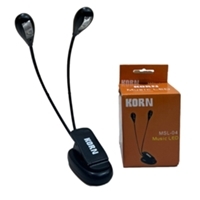 Features a super bright LED, with extra smooth and even illumination due to a special lens over the single super LED (light emitting diode) which is as bright as three regular LEDs. Energy efficient, powered by three 'AAA' batteries (included). Bulb never needs replacing. 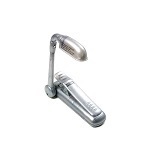 Clips on to almost anything, from music to microphone stands and may be used as a handy freestanding task lamp as well. 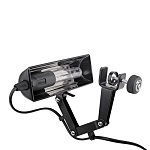 Broad-beam lamps in attractive goose neck design with a double arm, electrical transformer 230 volt/12 volt with 2 x 20 watt NV halogen lamp, grounded plug, four-meter supply cable with dimmer for phase control.